I was a child when it first appeared at our house. Both my mother and my sister were extremely allergic to pine trees, so we never had a live Christmas tree growing up. Our tree came in a box. Its limbs were hooked one at a time onto a pole and each branch was individually bent upward for maximum hanging ability. It was like having an enormous green twisty tie to manipulate for a month out of the year. Somewhere along the way, we were gifted a scented ornament to counteract the unpleasant aroma of plastic and that "new car smell" that is a part of owning a fake tree. I named the ornament the Hexagon Claus because of its shape and pictures of Santa and Mrs. Claus donning their respective sides. Hexagon Claus smelled of cinnamon and pine, but not the real kind...more of the air freshener variety. The scent was overwhelming and filled our entire house with what eventually would become the smell of Christmas for me and THE ornament to hang on the tree. My sister and I would rampage through boxes, casting aside far more expensive decorations in search of it. It's possible that this ornament may have caused my sister and I to engage in verbal and physical violence toward one another, but those allegations are unfounded at this time. I have no comment on the matter other than it was all part of the Christmas tradition. Unfortunately as I got older, Christmas had lost it's appeal to me. So many bad things had happened in my life right around Christmas that I lost the spirit and joy of the holidays. My parents were no longer together on the couch opening presents with us or staying up until the wee hours of the morning making sure Santa hadn't forgotten anything on our list. I lost my sister and grandmother during the holidays in 1993. The winter always wore me down emotionally and physically. It's not like I didn't have a lot of love around me during the holidays. My family and friends were incredible. There was just a piece of my heart missing and the only thing that really gave me a morsel of that joy was a little smelly ornament. Every time I opened that box of decorations that smell would bring me back to my happy childhood. Back to simpler times where the weight of the world was not bearing down upon my shoulders. I'd pinch the soft cloth ornament between my thumb and finger like a baby with it's blanket as I wished for the day I would learn to like Christmas again. It wasn't until a few years ago that my thoughts started to turn. My mother called asking me to swing by and pick up a few things from the house that she found for me. My wife and I had purchased our first home the past summer, so naturally, everyone had things to donate to us. I wasn't terribly excited by the idea of another box load of nic nacs, but I went over anyways. When I arrived, Mom sat me down and handed me a medium sized red box. “Take your favorite ornaments. You have your own home to decorate now.” I opened the box and sure enough there were all of my favorite ornaments from my childhood including the Hexagon Claus. Its aroma was still so strong that the smell managed to embed itself deep within the fibers of most of the old decorations. For the first time in years I was excited about Christmas! I could make new memories with my wife in our own house with a piece of my childhood. I kissed my mother on the cheek and dashed home to see my wife. I burst through the door like...well...like a little boy at Christmas, calling for Carly to show her our new decorations. She smiled as I placed the Hexagon Claus on our new tree. Carly had been trying to bring me out of my Christmas funk for our entire relationship, so this newly found yuletide spirit thrilled her! 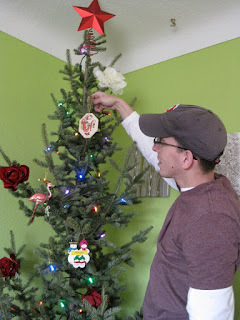 Her family had their own tradition of tying roses to the tree, so we started doing that as well. We tied two white roses: One for my sister and the other for her mother, who we lost a few years ago. All of the red roses represent those we love who are here and who are no longer with us. We've even started using a live tree with the knowledge that if it ever starts to give me problems breathing we'll go back to the ol' "twisty tie" tree. Three seasons and no problems. Hooray! To this day I still struggle to get pumped up for Christmas. I get lost in the hoopla that is the holiday season just like everyone else. "What do I get this person? I want this...I want that...." It's only after I find my little smelly ornament that the season's reason fills my house and I remember what this holiday is all about. It's about believing that good things can happen for myself and others. It's about taking moments to remember the past, having courage to live in the present, and to hope for the future. I know it sounds like a cheesy made-for-TV-movie ending, but it's what I believe. Thank goodness for smelly little ornaments, huh? I hope the aroma never fades away. Who did the smelly hexagon ornaments come from? I have the matching Mrs. Claus one on my tree right now. I'm pretty certain it's lost that yuletide scent, but I'll take a whiff when I get home. Maybe your family gave it to us? Grandma? Anyhow, I always thought that ornament was kind of fugly, but thanks to your story, I'm psyched that I have one of my own. This is the first year I've had a real Christmas tree in my life (! ), and I was just recently telling Maggie that one of the main reasons we always had a fake one was so Angie could come over during the holidays. I miss her lots and, as always, am thinking a lot about you guys this time of year. Indeed this is THE ornament of the season! Do you remember Angie's easy-bake oven? You always got to blow out the candles and get the first little bite of Angie's "Happy Birthday, Baby Jesus" cakes on Christmas morning. One of the little things at our own home, in between my family on Christmas Eve and your dad's family on Christmas Day. All good stuff to cherish. Love this story, Joshy. And I love you. Once again Josh, You have brought tears to my eyes with your words! This is an amazing post! It makes me jealous that your tree actually means something, all my ornaments are just ones I got on sale last year after Christams..no story.. unless you count them being 75% off a story? I love the roses on your tree and it's so special that you are using them to remember the people that are no longer with you. I have a ivy plant I got when my grandfather passed away and it has grown for the past seven years into a monster! I always think of him when I water it. I might have to start doing something like your roses for my tree to make it more special! I wish you a Very Happy Holiday season!